The White House Flickr feed is really something to behold. 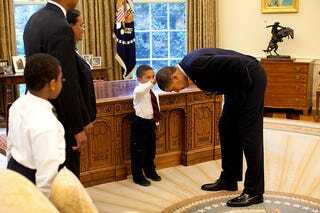 Here's the president getting his caesar 'do inspected by a tiny hair afficionado. The caption? "The youngster wanted to see if the President's haircut felt like his own." Be sure to check out our take on Five Obama Hair Dont's, and THE ROOT's take on black men who are sheen, mean and clean.